The guys at The TAS Partnership have come up trumps again. They’ve just published another objective, factual report that cuts through the prejudices and myths surrounding deregulation and its impact on bus travel. 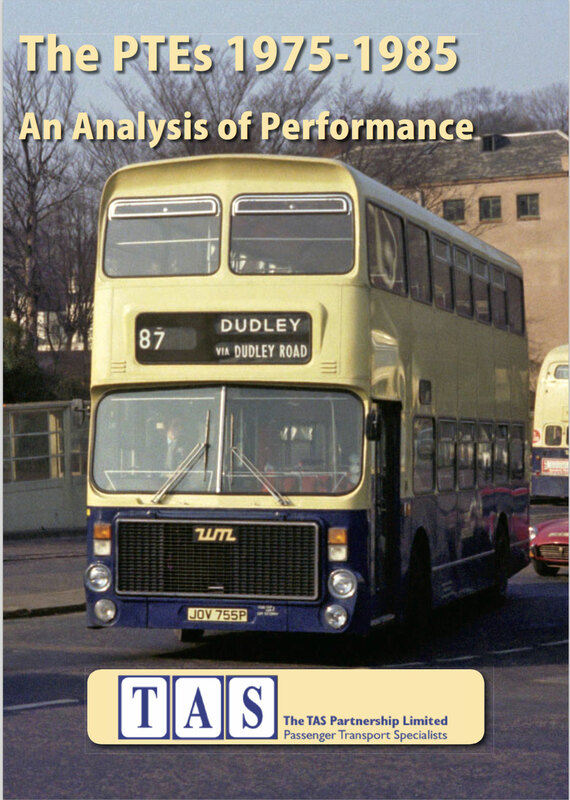 ‘The PTEs 1975-1985 – An Analysis of Performance’ has been compiled from Annual Reports and Accounts of National Bus Company subsidiaries and PTE operating companies during the twelve years from 1974 to 1986 as well as archive news reports in ‘Commercial Motor’. And what a revelation it is. I worked with NBC in West Yorkshire for two years from 1975 just after the two Yorkshire PTEs were established and it’s easy to forget the huge impact the Local Government Act 1972 had on the industry not long after the structural changes brought about by the Transport Act 1968. This report brings it all back and is a timely reminder as submissions are made in Newcastle this week and next to the QCS Board along with the unstoppable momentum towards franchising in Manchester. 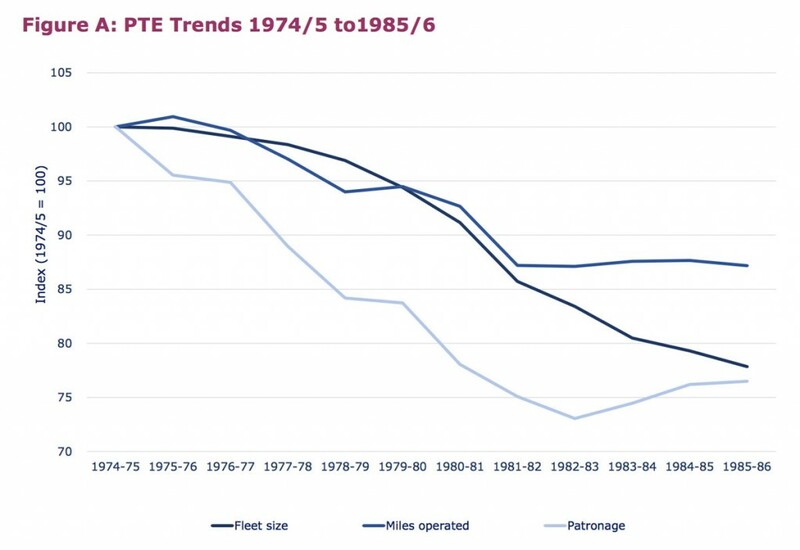 Headline reminders of how things panned out in PTE land between 1974/5 and 1985/6 are: fleet size fell by over 19%; service miles operated fell by 10%, revenue down by 15% in real terms; and get this, operating costs stood at 158% (yes, 158%) of 1974/75 levels in 1985/86 in real terms; Passenger journeys fell by 20% and the need for public funding increased to 65% above 1974/75 levels. The report identifies two distinct periods during its twelve year review. Between 1975 and 1980 PTEs (except South Yorkshire) used traditional methods of making ends meet in a declining market by reducing mileage, cutting PVR and increasing fares. In some ways it wasn’t ‘traditional’ as crucial to the current debate about franchising and local authority control is back then a higher proportion of lucrative ‘main line’ frequent services were cut compared to less remunerative routes so network coverage could be preserved. The perverse outcome being revenue falling more than costs, and higher reductions in passenger journeys. It’s fascinating to recall between 1975 and 1980 cumulative inflation based on RPI was 243% and the cumulative effect of fares increases in Greater Manchester was 379% and 427% in West Midlands. Merseyside and Strathclyde both took over 200 vehicles out of their fleets during the same period. In South Yorkshire their alternative policy of freezing fares saw patronage growth of 11.7% in 11 years (hardly impressive compared to some of the achievements in today’s deregulated world) and this policy was financed by revenue support increasing in real terms by a whopping 263% and concessionary fares payments rising by an incredible 506%. From 1981 PTEs changed tack, moving closer to the South Yorkshire model with stable fares and network provision supported by increasing calls on taxpayer funding. This practice only ceased on abolition of the metropolitan counties and the imposition of strict expenditure limits by central government. During this same period NBC shrank its business significantly more than the PTEs but achieved much better financial performance by the simple expedient of better cost control and taking out more costs in proportion to revenue. So while the fleet reduced by 10% more than the PTEs and service levels were down 5% more with 14% more passengers being lost, operating costs were reduced in real terms by 2% against a 4% increase at the PTEs and revenue decreased 9% less than the PTEs. The report demonstrates very clearly how it’s a false assertion that above inflation fare increases and reduced passenger journeys were caused by deregulation in 1986. As already observed, from 1981 PTEs followed a policy of freezing fares and used public funds to directly subsidise the resulting deficits. Within four years by 1985 this policy had become unsustainable as PTEs called on rapidly increasing amounts of subsidy funded through local rates at a time when central government was limiting public expenditure. The Local Government Act 1985 aimed to tackle the wild divergence in policies between the Conservative central government and the Labour controlled Metropolitan counties. Indeed the Act led to their abolition as well as imposing strict limits on expenditure and it is this, and not deregulation, which led to large increases in fares which began in April 1986 ahead of deregulation in October. South Yorkshire increased fares by 19% in January 1975 but then froze them for eleven years until April 1986 when a 225% increase became necessary. Tyne & Wear had frozen fares after a 10% increase in November 1982 until a 20% increase in April 1986. All the PTEs implemented double digit fare increases six months ahead of deregulation. Clear tables and explanatory diagrams throughout the report spell out the starkness of the story of decline in bus use. One graph shows PTE trends from 1974/5 to 1985/6 excluding the distortion of South Yorkshire data. At its nadir in 1982/3, PTEs had lost an average of 27% of the 1974/5 level of patronage, but it then recovered as the miles operated and fare levels were stabilised. Three of the PTEs: Manchester, Strathclyde and West Yorkshire had lost 35% of patronage by 1985. You get a real sense of why the Government had to take radical action to prevent the bus industry literally disappearing under cumulative double digit fares increases or subsidy requirements along with patronage in free fall. Deregulation had to offer a solution since the 1968 and 1972 Acts extolling co-ordination clearly hadn’t worked. The report reminds us how there were also two distinct phases of the British economy during this period. The five years up to 1980 were characterised by high inflation, low unemployment and frequent industrial unrest while the five years post 1980 saw low inflation, high unemployment and the decimation of heavy manufacturing as the Thatcher Government’s initial policies took effect. Inflation peaked in 1975 at almost 27% and stayed in double-digits until 1981/2 (except for 1977/8) while conversely 1981/2 was the first year when double-digit unemployment was recorded, which stayed above 11% right through until 1985/6. Socio-demographic trends are also recalled including the rise of car ownership ranging from 27% in Merseyside to only 5.5% in Tyne & Wear. Population declined across the period only offset by South Yorkshire in 1980/1. It’s also instructive to compare the track record of PTEs during this period with similar contemporary statistics. TAS have done just that, comparing 1982/3 (three years before deregulation) with 2013/14 (the latest figures available). This shows spending on revenue support is down 84%; income from passengers falling by only 6%; yet income from the taxpayer has fallen 76%. Passengers contributed 58% of revenue directly in 1982/3 but 84% in 2013/14. Perhaps the killer comparison which illustrates the lie that deregulation has failed the Metropolitan areas is that patronage declined 20% in the twelve years to 1985/6 compared to a 14% decline in the 12 years to 2013/4. Counter intuitively BSOG has actually risen in real terms by 41% in 2013/4 compared to Fuel Duty Rebate in 1982/3 but this reflects increases in fuel tax during that time coupled with deteriorating fuel consumption. Aside from the statistics and trends the report helpfully and pointedly reminds us of many of the non-financial issues prevalent during the PTE operational period. On their establishment in 1968 there were historical demarcations between ‘company’ and ‘corporation’ routes and historic practices for picking up passengers and protective fares. The initial PTEs split into two pairs in deciding their working relationship with NBC. Merseyside and Tyneside came to an agreement with local NBC companies at an early stage followed in due course by the two Yorkshire PTEs after 1974. SELNEC (which became Greater Manchester) and West Midlands both came to the conclusion they couldn’t work with NBC or reach suitable operating agreements leading in due course to the bulk of North Western Road Car being sold to SELNEC (£26.3m at 2014 prices) in 1971 and the central core of Midland Red to West Midlands (£41.5m at 2014 prices) in 1973. Having studied contemporary reports of the time, TAS conclude the reason these two PTEs found it so difficult to reach agreement with NBC operators was ‘largely down to the personalities involved and a large degree of intransigence on both sides’. ‘As with current issues surrounding Quality Contracts, who had ultimate ‘‘control’’ was a major factor’ the report astutely observes together with separate tensions caused by the ‘big city’ elements of PTEs with Manchester dominant in SELNEC, Birmingham dominating the West Midlands and so on. The report observes these issues ‘were never really resolved and to a degree still have not’. It’s also easy to forget just how unreliable services were in those days. Figures taken from the annual reports show lost mileage on NBC routes peaking at 2.73% in 1979 which itself hides significant regional variations with urban areas suffering from severe staff shortages hit worse than more rural areas. In PTE areas in the late 1970s double-digit percentage lost mileage was commonplace. It was also an era when vehicle manufactures ruled the roost. None of this customer service business in those days with PTEs having great difficulty even obtaining the vehicles they wanted. West Midlands PTE, for example, is quoted as attempting to order 600 Leyland Fleetlines, being told by British Leyland it couldn’t accept the order! It’s Annual Report for one year stating ‘of an order for 400 buses … only 174 had been delivered by 31 March …. workshop procedures was still being disrupted by the need to rectify 22 year-old buses’. As well as staff shortages and high turnover it was also a time of strong trade unions who used their ‘muscle’ when negotiating with a large PTE or centrally with NBC compared to the former individual municipal operators. This led to higher wage awards, more costly arrangements for shift compilation and restrictive practices. Voluntary weekend working in Sheffield, for example, often led to 40% of Saturday evening bus workings being unstaffed in 1974. One positive outcome of this period was the introduction of Travelcards, and before London got round to it too! They achieved significant market penetration with 37% of peak passengers in West Yorkshire using a pre-paid ticket in 1984/5, for example. On the downside the six English PTEs adopted a policy of single route numbering for their whole areas adding to complexity and unnecessary change. This report is a great addition to the current debate about the best way to run buses for the public benefit. Hopefully it’s on the reading list of those engaged in the hearings in Newcastle and those pontificating the future in Manchester. If you would like to read the report for yourself, it is available free of charge in electronic (PDF) format. Go to www.taspublications.co.uk and follow the links to the Online Shop.